Public tours, normally offered every Wednesday, will be temporarily suspended after June 14, 2017, due to construction. They will be resumed at a later date as construction permits. 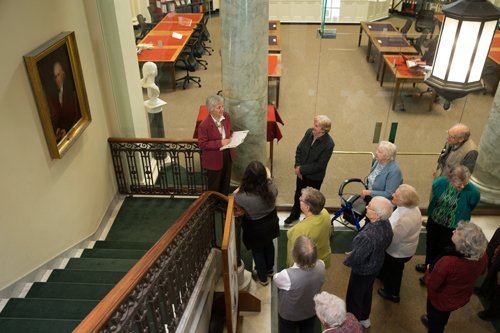 The American Antiquarian Society's library contains 25 miles of shelves that hold over four million items, including books, pamphlets, broadsides, newspapers, periodicals, sheet music, and graphic materials. The library contains more than two-thirds of all known imprints created in America before 1821, making it the single greatest repository of such materials in the world. Additionally, the Society’s holdings of American printed materials dating from 1821 through 1876 are among the strongest anywhere. Attend a tour, present your WOO card and earn three WOO points. The Worcester Cultural Coalition oversees the WOO Card - a program designed to open the door to Worcester County's vibrant cultural community. Card holders receive discounts and special offers for cool concerts, dynamic theater, unique museums, magical music, street festivals, outdoor adventures and more - throughout Worcester County, throughout the year.